A woman in Charlotte, North Carolina owns an unassuming pin that, according to her family’s lore, is actually made of metal drawn from the Liberty Bell. It seems unfathomable that a piece of one of America’s most iconic symbols could have been melted down for a mere memento. But our contributor’s great grandfather claimed that he wore the pin to an event important enough to lend credibility to his unlikely story. A generation after the Civil War, America was still recovering from its traumas. Dramatic measures were called for to heal the nation’s economy in those dark days. 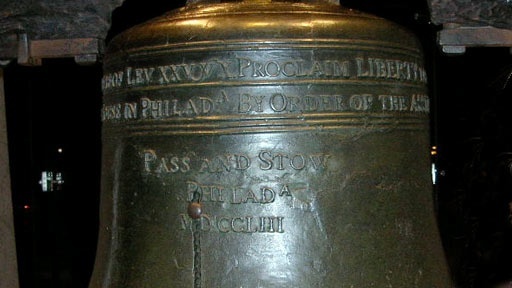 The Liberty Bell became a symbol of unity as it traveled from north to south. History Detectives recalls the staunch efforts for reconciliation during this tenuous time in U.S. history. Also in Season 5 Amos n' Andy Record Is this aluminum record an early recording of the old-time radio series? Also with Elyse Luray Chinese Opium Scale Could this really be an opium scale from the Chinese community of Montana? Also with Elyse Luray St Valentine's Day Massacre Was this weapon fired in one of the nation's most infamous crimes? Related Investigation Confederate Eyeglass Is this how southern sympathizers identified each other during the Civil War? Also with Elyse Luray Pebble in the Sand Is this rock found on a beach a link to an ancient civilization or just another pebble in the sand?